Barbara McClintock (June 16, 1902 – September 2, 1992) was an American biologist. She was a distinguished cytogeneticist who worked on inheritance in maize. McClintock was awarded the 1983 Nobel Prize in Physiology or Medicine. McClintock got her PhD in botany from Cornell University in 1927. Maize cytogenetics was the focus of her research for the rest of her career. From the late 1920s, McClintock studied chromosomes and how they change during reproduction in maize. She used microscopic analysis to show genetic recombination by crossing-over during meiosis—a mechanism by which chromosomes exchange information. She produced the first genetic map for maize, and demonstrated the role of the telomere and centromere. These are regions of the chromosome that are important in preserving genetic information. She was recognized amongst the best in the field, awarded prestigious fellowships, and elected a member of the National Academy of Sciences in 1944. During the 1940s and 1950s, McClintock discovered transposition and used it to show how genes are responsible for turning physical characteristics on or off. She developed theories to explain the control of genetic information from one generation of maize plants to the next. Encountering skepticism of her research and its implications, she stopped publishing her data in 1953. Later, she made an extensive study of the cytogenetics of maize races from South America. McClintock's research became well understood in the 1960s and 1970s, as researchers discovered the mechanisms behind the genetic change and gene regulation that she had shown in her maize research in the 1940s and 1950s. Awards and recognition for her contributions to the field followed for the discovery of transposons; she is the only woman to receive an unshared Nobel Prize in the category 'Physiology or Medicine'. 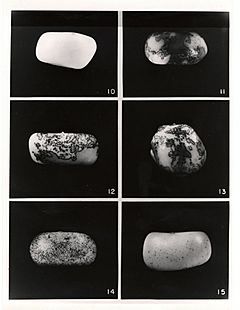 In the summer of 1944 at Cold Spring Harbor Laboratory, McClintock began systematic studies on the inheritance of colour patterns of maize seeds. In early 1948, she made the surprising discovery that two genetic loci, Dissociator and Activator could transpose, or change position, on the chromosomes. McClintock also found that the transposition of Ds and the is determined by the number of Ac copies in the cell. Between 1948 and 1950, she developed a theory: these mobile elements regulated genes by inhibiting or modulating their action. She referred to Dissociator and Activator as "controlling units"—later, as "controlling elements"—to distinguish them from genes. She suggested that gene regulation could explain how complex multicellular organisms made of cells with identical genomes have cells of different function. McClintock's discovery challenged the concept of the genome as a static set of instructions passed between generations. In 1950, she reported her work on Ac/Ds and her ideas about gene regulation in a paper. In summer 1951, when she reported on her work on gene mutability in maize at the annual symposium at Cold Spring Harbor Laboratory. Her work on controlling elements and gene regulation was difficult and was not immediately understood or accepted by her contemporaries; she described the reception of her research as "puzzlement, even hostility". Nevertheless, McClintock continued to develop her ideas on controlling elements. She published a paper in 1953 where she presented all her statistical data, and undertook lecture tours to universities throughout the 1950s to speak about her work. She continued to investigate the problem and identified a new element that she called Suppressor-mutator (Spm), which, although similar to Ac/Ds, displays more complex behavior. McClintock, B. (1950). "The origin and behavior of mutable loci in maize". Proceedings of the National Academy of Sciences of the United States of America 36 (6): 344–355. PMC 1063197. PMID 15430309. McClintock, B. (1953). "Induction of instability at selected loci in Maize". Genetics 38 (6): 579–599. PMC 1209627. PMID 17247459. McClintock, B. (1961). "Some parallels between gene control systems in Maize and in bacteria". The American Naturalist 95 (884): 265–277. doi:10.1086/282188. Barbara McClintock Facts for Kids. Kiddle Encyclopedia.